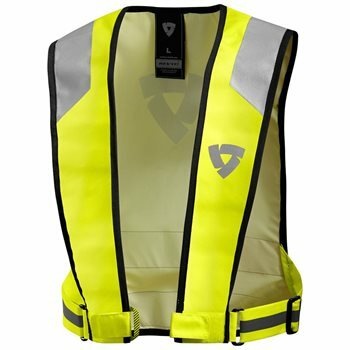 With the vest Connector HV Hi Vis vest a rider wearing any jacket can easily and instantly be upgraded to better visibility. It is designed to wear over all jackets in a subtle and stylish way. It can be connected to a range of REV'IT! jackets without losing access to any of your jacket's original features. Thanks to its vented mesh construction and well-conceived harness that snugs down easily, the Vest connector HV won’t flap around or bubble with air like a parachute. The neon yellow fabric combined with the 3M Scotchlite™ reflection stripes dramatically increases riders’ visibility on the road. EN471 is a European standard for the materials, colours, and reflecting power of protective apparel. The aim of the standard is to make the wearer highly visible under all conditions, whether in daylight or headlights. Note: Vest does not connect to all REV'IT! Jackets, please read jacket description carefully, or let us know if you have questions.